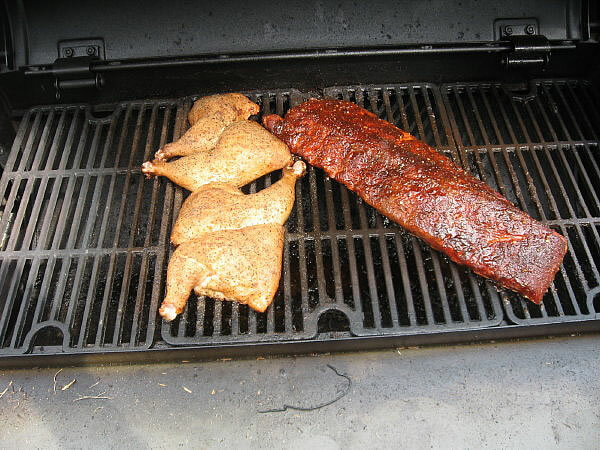 Cold smoking is very similar to hot smoking, except the cooking temperature is much lower. The targeted cold smoking temperature range is between 80 degrees F and 100 degrees F, and the smoking time can range anywhere from 4 hours to 4 days. This process relies on smoke to cure the meat or food being smoked instead of using heat. Some people believe that cold smoking occurs at temperatures between 160-190 degrees F, but smoking at this temperature is really a form of hot smoking. A few examples of foods that are usually cold-smoked include bacon, sausage, ham, cheese, and fish. When smoking fish, a preservation salt is needed to pickle the fish before it is smoked. This will help prevent bacteria from growing while the fish is curing in the smoke. Cold smoking is very difficult, and even impossible in the summer months, because the outside air temperature is normally as hot as or hotter than the temperature needed for true cold smoking. The best time to use cold smoking is during the winter months when the days are typically cooler. The key to cold-smoking is using smoke to cure the food. To achieve such a low cooking temperature while cooking with smoke, the fire needs to be in a separate container than the food being smoked. The smoke is transferred to the cooking container by piping, and the heat can be easily regulated. If you are using a wood smoker with a offset fire box, it can be very hard to consistently maintain the low temperature needed for cold smoking. The easiest way I have found to achieve the low cooking temperature is to use a charcoal starter to light only a few coals at a time. When the coals in the smoker burn down, simply use the starter to light more charcoal, to add a small amount of charcoal that is already lit to the fire box. Then wood chips can be added to produce smoke. Use frozen salmon because it has lost some of it's moisture during the freezing process, and it will accept the brine solution quicker. 1. Cut the Salmon filets into 3x6 inch pieces. 2. Prepare a brine solution of salt, brown sugar, and water. The salt to brown sugar ratio is 2:1. With 2.5 gallons of water, you will need 7 cups of salt, and 3.5 cups of brown sugar. The water will be about 80% salt, and to test if the water is salty enough, and egg should float. 3. Place the fish in the brine solution. Make sure the fish filets are completely submerged. 4. Refrigerate for 12-24 hours. If the filets are thin, the time will be shorter. 5. Before removing the fish from the brine solution, slice one filet open down the middle to see if the brine has fully penetrated it. If the brine has not fully penetrated the filet, place leave the rest in the solution for a little longer, and then test again. 6. When the filets are done, remove them from the solution and place under cold running water for 1 hour. 7. Place the filets on a cookie sheet, and refrigerate for 12 more hours. This will allow the salt to even out. 1. Place in a smoker at 70-85 degrees F for 12-16 hours. I use charcoal and add mesquite or hickory chips to produce the smoke. 2. When the fish are done, vacuum seal the filets and freeze for 3 days for parasite control.